If you’re thinking of filing for bankruptcy, take the advice of an experience, bankruptcy attorney. Be honest, truthful, open and revealing when dealing with your bankruptcy lawyer. If you have assets that are going to be unprotected, your lawyer will advise you with regard to those assets. If you have made transfers that could be determined to be fraudulent, your lawyer will advise you as to what can happen with those transfers. Whatever is going on in your financial situation, you must make a full disclosure to your lawyer so that the right thing can be done. Unfortunately, there are times when the bankruptcy lawyer simply does not know what the client has done before, during or after the case is filed. The risk will then shift to the debtor with regard to these actions. One such example is where a debtor fails to disclose an asset or set of assets to the attorney. The bankruptcy petition gets prepared, signed and filed with the clerk of the United States Bankruptcy Court based upon the information provided by the debtor and ascertained by the attorney. As far as creditors, the debtor will provide a list and the attorney will typically obtain a credit report listing all outstanding debt. From the list of debts owed, the attorney has a pretty good idea thanks to the credit report as to what is actually owed. As far as assets however, the debtor has to provide the bulk of this information. If the debtor is not truthful, he is subject to a number of penalties. Among the penalties are court sanctions, denial of discharge of the debt and possible criminal charges for concealing assets through the bankruptcy process. 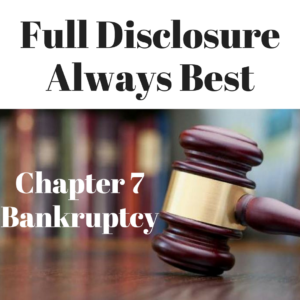 The attorney will have an ethical dilemma should the debtor reveal assets in private after the 341 meeting of creditors, but prior to the entry of discharge. The attorney has a duty to the client and an obligation not to commit or become involved in any fraudulent activity. This issue has to be balanced on a case-by-case basis. One option would be for the attorney to withdraw from representation and the other would be to continue representation provided the attorney does not have actual knowledge of the events. The lesson for individuals going through bankruptcy protection is to be absolutely 100% truthful with the bankruptcy lawyer. If an asset is at risk, there are remedies to that problem. One such remedy would be to file a chapter 13 bankruptcy instead of a chapter 7 bankruptcy. In a chapter 13 bankruptcy, the debtor maintains ownership and possession of all his property while repaying a portion of the debt over a 3 to 5 year period. The other option is to surrender any non-exempt interest in the property in exchange for the chapter 7 fresh start. It is better to lose a small amount of property that to have the entire discharge denied and possibly face criminal charges for failure to disclose an asset. These are issues that an attorney can help with provided he or she knows about the asset. If the attorney is completely kept in the dark, there is no way he can provide excellent advice. For more information on bankruptcy, your assets and your liabilities and how you can be helped under the Bankruptcy Code, you can contact me at 847-520-8100. I always offer a complimentary, initial consultation so that you can learn your rights and obligations and make an educated decision on whether bankruptcy is right for you and your family. I can also provide emergency service in the case of a sheriff sale, wage garnishment or other court citation.